In 1915, Laura Ingalls Wilder took a journey by train, from Mansfield, Missouri, to San Francisco, California, to visit her daughter Rose. She spent two months with Rose. Laura wrote letters to her husband, Almanzo, who stayed back in Missouri to take care of the farm. This is a collection of those letters. Laura wrote almost daily to Almanzo, even before she left the state of Missouri. She promised to be eyes for Manny as she traveled west to San Francisco, as well as while she explored the city with Rose and Rose's husband. Rose was writing for a newspaper, but between assignments she spent the day with her mother, walking or taking the trolley around the city (though some days Laura went on her own because of Rose's commitments). The World's Fair was a big event at the time, and Laura spent numerous days exploring the exhibits from around the world. She later wrote about her experiences at the Fair in a local Missouri publication. Laura had so many adventures during her visit, on land and at sea, that I was exhausted for her. She told Manny that sometimes she needed an entire day to rest. 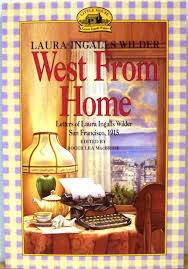 Laura did mention the Great War (WWI) in her letters, ongoing in Europe since the year before. She described ships leaving the Bay, perhaps only to be sunk by a German submarine. Rose was extremely fond of her mother and attempted to convince her to consider relocating to San Francisco where she and Manny could still farm. Laura believed the city spectacular; but the more she pondered the thought, the more she knew Missouri was the right place to be. Believe me, there is no place like the country to live and I have not heard of anything so far that would lead me to give up Rocky Ridge for any other place. I truly believe that when I come home and talk it over with you (Manny) we will decide to be satisfied where we are and figure out some way to cut down our work and retire right there (in Mansfield). Of all the correspondence Laura did, she did not tell Manny that she fell off of a trolley car and hit her head. She spent a few days in the hospital. Rose had to tell her father in a letter. Thankfully, Laura did recover. Probably the most laugh-out-loud moment of this collection came from Rose in a note she wrote to her father and included in her mother's correspondence to him. Rose wanted him to know that Laura was getting fat; and she blamed the scones and fish at the exhibition.
. . . I am in mortal terror every minute that she will not be able to restrain herself any longer, but will break the glass and eat some of them (fish) right there. Even with two scones and a package of Pan-pak and fifteen cents worth of salted nuts and rosecake and a bag of Saratoga chips in her hand, she still looks at the fish with the same longing expression. I fear by the time you get this she will be still fatter. Anyway, I've done my duty and told you. Well, this is almost the end of my Little House RAL journey. I am eager to start the last book on the list, Pioneer Girl, by Pamela Smith Hill. See you next month. I read through these books several times as we did a two year unit study based around the novels for each of our children's homeschool. I love the series, and am especially attracted to reading through them in the coziness of winter. They definitely feel like that. This is my third consecutive year reading them. It's becoming a habit.